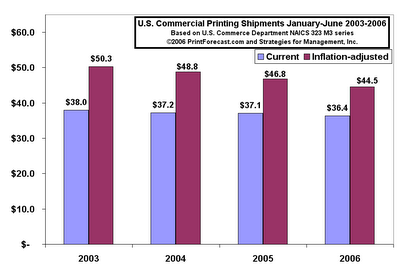 Printing shipments were up in July by $254 million in current dollars, a 3.4% increase compared to July 2005. June shipments were revised up by $81 million. On an inflation-adjusted basis, shipments were about flat with last year. This is the third month in a row where current dollar shipments were above the same months of the prior year. While physical shipments are probably flat, and these are easy comparisons to last year's horrible downturn, the industry may have found a pause in its decline. The media shift is still continuing, but the precipitous decline of last year looks like it is behind us. The Toronto Star is offering a PDF edition! For the past few months, whenever I've heard the phrase "fragmentation of media," referring to the splitting or media dollars across more alternatives, I've had the sense that it's just not right. Not that media dollars aren't being split up in different ways: that fact is quite clear. Humpty Dumpty was fragmented when he fell of the wall, in the old fairy tale. A dropped flower pot is certainly fragmented. And just like Humpty could not be put back together, or that flowerpot will always have pieces that no longer fit, the idea of fragmentation is not really right. Fragmentation does not impart the sense that those dollars are being split in the quest for an optimized, and cohesive communications program. In other words, they're not fragmented at all. The word fragment is used to describe the Dead Sea Scrolls... there are pieces missing, and they do their best to piece them together and match them with other texts that were known to exist from the era or translations that have survived through history. The intent of media planners is not to fragment anything, but to have consistent branding, messaging, and audience awareness (and reaction) across media. That is, it's a holistic approach to the process. Fragments can't produce synergy... "fragmentation" is the wrong word. And there's another reason.... fragmentation is what it appears to be from the vantage point of an outsider. Our job as marketers is to see things the way our customers do. To see it otherwise is to ignore the customers problems and goals, and that's exactly where marketers' opportunities are. Sure, some folks think it's great for government to just give money to companies to have them remain in a certain geographic area. As a former Long Islander (1982-1989) who left because of high taxes (and other things, too), I read this story with interest. I've always wondered about these kinds of grants loans, and the economics generally play out to show that this kind of activity ends up as a bad deal. Chemco Photoproducts, my employer from 1981 to 1987, got one of these loans, and never did what was intended with it (build a new coating alley: they got spooked by silver prices and overestimated the adoption of direct-to-plate [only by about 15+ years]; they never built the alley and missed the doubling of the graphic arts film market in the 1980s). I have seen other situations where government money never made it to its originally intended purpose, but I need not bore anyone with these instances. But it did make quite an impression on me at the time. First, this kind of "relief" discriminates against smaller businesses, and especially businesses that have not yet formed. Milton Friedman always reminded us that established business always get attention, especially if it is big, and politicians and business advocates love to have their picture taken at a groundbreaking or other event to commemorate their "wise" transfer of funds. A good example is New York City. Long the haven of small printers, especially around Varick Street, these businesses were pushed out by landlords and others, and they flocked to New Jersey. Today, there is no printing industry of note in Manhattan. But some big printers have gotten incentives to stay, yet thousands of jobs exited with barely a whimper. But saving tens or hundreds of jobs gets attention, even after thousands slowly exited after years of inaction. When governments have to give away money to keep existing businesses in their current areas, it is a sign that something else is wrong. But most importantly, if a business cannot generate capital to make its own purchases, it should do something different in order to do so. Better to fix the reasons behind the capital shortfall, and that may include moving to a different location where the total costs of business are better. If this is such a good idea, attracting private capital (or even a loan) would have been an affirmation. This kind of discrimination against smaller printers and those media businesses who have to cope with the risks of starting up is counterproductive. Better to reduce the property taxes of homeowners by $7.5 million so that they have the additional capital to invest where and when they choose. Or (gasp) put it toward something that enhances commerce for everyone, regardless of industry. Let's look at Gov. Pataki's words: "When a company invests here, it contributes to the success of our economy and toward a brighter future for all of New York State." Let's try this: "When we have to bribe companies to stay, it looks like we're doing our job, but we're really overtaxing people and discouraging smaller businesses from staying." And needless to say, there are no guarantees that the equipment or the management of the company will do what they say. Risk should be left for the entrepreneurs and financial intermediaries. Kodak story in BusinessWeek: "Kodak Rewrites The Book On Printing: Its new inkjet technology could revolutionize the industry -- and revive the flagging icon"
Do we really believe that printing or commercial printing can "save" Kodak? I doubt it. I have no doubt that the printing division will become the best performing Kodak division, but the weight of the failing operations will cancel out the good news, just like it has at Xerox, as the b&w business declines, cancelling the strides in color they are making. XRX may be past that point now, however, where color growth and profits may finally be big enough to withstand the b&w drag. Kodak is probably not at that point yet, and look at how many years it has taken XRX to get there. These kinds of things take twice as long and cost twice as much as most people think... or hope... or want. Anyway, the story says that its ink jet goes at offset speed, which I calc'd from their notes as 2,000 feet a minute, which of course many offset presses passed a while ago. It makes no mention of the width of the device; it's number of pages per minute, of course, that really matters in the "spec wars." (Spec wars get really silly after a while; the question really is whether or not it produces saleable materials at costs and prices for which buyers are willing to pay and producers are willing to adopt). Funny how this Kodak story appears just after all of the industry analysts and writers had a shindig in Rochester last week. We deserve what happens to us, then, don't we? "Hold your friends close, hold your enemies closer," is the famous line from The Godfather, Part II... unless you're the printing industry. Our motto must be "let your enemies take away your customers without a fight." I've mentioned the book The Long Tail in the past, and I will be writing about it somewhere soon. But this short article was in today's Advertising Age e-mail called "Three Ways to Ride the Long Tail." ...in a Long Tail world, reach has entirely new meaning. Many niche sites, for example, can't hold a candle to the traffic at the head of the media curve. However, what they do have going for them is credibility. If your brand is mentioned five times on a site that your 20 most influential customers trust, that's gold. Printed coupons... are still doing well! Good (but long) article about market behavior that discusses forecasting, decision-making, and the use of information, with the nice twist of comparing it to one of my favorite movies, Groundhog Day. Highly recommended, and stick with it... that's the article... the movie is easy to stick with, probably Bill Murray's best role. Soon I'll be publishing a long post about free software and even my Linux experiences.... but this is too good to pass up. Since school is starting, it's time to get everyone back in gear and term papers will be starting soon. Sun Microsystems to the rescue... StarOffice, their full-featured version of the beloved OpenOffice, is available free to students and educators. Say no to buggy Microsoft Office! The video is hosted on youtube.com which is one of the hottest web sites for the past year; video is the next frontier as broadband becomes cheaper, faster, wider, ubiquitous. Technological change challenges the most basic of our assumptions, and the definitions of terms we use every day. Dr. Samir Husni (Mr. Magazine) discusses that in this article. Interesting background on the Knight-Ridder sale and what led up to it. I don't think so... this is what it looked like from the inside. From the outside? They got out when the "gettin' was good," as they say. K-R had a habit of doing things at the wrong time in the most expensive way. Online research service Dialog was a good example. They were Googled into oblivion (or more accurately "specialty niche"), when they should have led the charge. Big companies protect their bureaucracies and their bonuses first. That's why upstarts, who have nothing to protect, end up killing them. Well, not exactly... they end up grabbing their growth opportunities. Will a backlash against the Blackberry be coming? I doubt it, but this article seems to imply that. It's funny how every technology that takes hold will be the ruination of everything and the initiation of some kind of psychological trauma. If anything, humans have proven to be more resilient than anyone thought, and are probably more so. I don't have a Blackberry, since I work at home, and find wireless wherever I go for my notebook (or at least I seek out wireless places). I'm anxious, though, to try the new Sprint/WiMax network when it hits the market late this year/early next year. It's amazing what these communications advances allow us to do. No more coming back to an office with a pile of pink "while you were out" sheets, or looking for a payphone to call in for messages/problems, or people wanting to see you to get a decision about something actually quite minor. The best of this is e-mail: answer in a time-shifted basis, share it easily with others and bypassing copying and mailing, and being able to link to outside required resources. The real question is knowing how to secure your private, personal time, and not let it intrude on that. I've found that people who have to be connected and available all of the time... usually have no lives, and require that constant connectivity and availablility because it makes them feel needed and important. I've embraced the famous deGaulle quote: "The cemeteries are filled with indispensible men." For that reason, networking-enhanced delegation is one of the primary gifts of this new communications age. We can transcend geography, extend our reach, and choose when we want to do so, beyond the constraints of 9-5. I happen to work best in the mornings and evenings. The rest of the day is rather unproductive. Basically my day is 5-9, twice, in a sense. But stuff happens in between because of delegation, time-shifting, and trust in the people I work with. It could not have happened prior to 1995. The rise and importance of blogging... and now it's big business! Interview of the CEO of Freeloader Press (free downloads of e-textbooks with ads, low-price ad-sponsored texts, etc). Adds to the items I posted the other day. I hate it when economists and NYT writers whine. Supposedly, growing prosperity overseas will cause inflation here. They cite China, noting that incomes are rising and the cheap labor that has been seen in goods will disappear. They forget a few things... first, there are still untapped sources of labor around the world, and one day, China will actually contract with them; second, there are many inefficiencies in China's economy that have yet to be attacked by the forces of economics, such as their inefficient use of energy, and the inefficiencies of their own government controls; third, rising demand in growing and developing economies create new markets and new demands for goods and businesses that do not yet exist (you know, kind of like who need needed cell phones, or wireless service just 15 years ago). Stop whining and work on rewarding creativity, entrepreneurship, and freedom instead. I thought rising incomes was a good thing. And there's other reports about how wages, etc. have not kept up with economic growth. Hogwash. The way wages are measured is grossly inadequate, and even when compared to GDP, you have to include all income, including benefits. Household wealth is continuing to set new records. It's like the lament about the savings rate when that's always "bad"-- yet it excludes pension plans and asset value gains in pre-existing savings, especially if they are capital gains that will only be realized upon their sale. Considering that the Dow is still not at its Spring 2000 highs, and that the NASDAQ is still not even half of what it was at that time, to have househould wealth continue to rise shows how resilient the true savings (cash+all assets, including homes) of US households are, and actually how well diversified they are. Another reminder of how media are changing, but the old guard doesn't get it. Magazines, Inserts, and Google... Why is It Always Google? TNS Media Intelligence release about newspaper inserts. Read down deep and inserts are down 2.2% compared to last year. Inserts are being used for higher ticket items, however. Watch this play out more as newspapers become a niche media for wealthier, more educated, and older readers. Don't get your hopes up. Another printer, Japs-Olson joined. As usual, the press release was sent as a word file attached to an e-mail. A Google search for the release yielded nothing. The Print Council web site as of 3:15pm EDT did not have the release. Past press releases are in PDF, not html, which would be easier for editors to copy and paste. The Print Council has never had a press release about the importance of print. Need we say more? Since its founding in 2003, the volume of print has dropped... and dropped... and dropped... yet there is no urgency or advocacy. 1) go where media deciders go... their trade shows (ad:tech), their publications (Ad Age, Graphic Design USA, Communication Arts, etc), their associations (AIGA, others), be in their panels, be in their magazines, sponsor their web sites, etc. 6) become the center for "offline media"
The momentum of e-media is too strong to ignore or overcome. Yet, the placement of the print medium in the modern media era is too important to ignore, and requires an urgency that is clearly not evident. A new bureaucracy has been born, with no energy or desire. This is not what we need. The PIA/GATF Workflow Conference will be held Sunday, September 17 and Monday, September 18 in Detroit. Dr. Webb will be speaking on Monday morning about the future of the industry and how production methods will be transformed by technology and the dynamics of the worldwide graphic communications marketplace. On Sunday, attendees will have a special tour of the Vistaprint facility in Windsor, Ontario. We know that Vistaprint does everything wrong: they use the wrong presses, have no personal selling effort, and waste their time on specialty products that you can't make money on... or at least that was the conventional wisdom. The company has turned well-established industry practice on its head, reporting more than $150 million in sales in its last fiscal year, up 67%, with profits of 13% on sales. How many companies in the printing industry would love those kinds of results? It's yet another sign that times are different and that trade truisms may actually be holding companies back. It reminds us that sometimes the key to success is to do what others deem illogical or impossible. The tour will be followed by discussions about integrating web-to-print capabilities in printing businesses. Newspapers Declining: Reuters Shocked; Ad Spending Down: No Kidding; Free Digital Economy Fact Book: We Like "Free"
Newspapers cutting staff... Sounds like Reuters just figured this out. BLS data have been showing newspaper weakness for quite a while. Nearly all the recent announcements promise pinpoint reductions rather than deep cuts. The reason publishers prefer a steady trickle, experts say, is that newsrooms are stretched too thin to allow deeper slashing. Companies that do little tweaks to their workforces rather than significant restructuring in light of what the industry will look like 2 or 3 years out will end up with constant bleeding, and nothing fixed at all. Don't forget that in some newspapers, union contracts were formed at the time when newspapers were invulverable.... just like the U.S. auto industry was. And how long before the U.S. industry restructured itself and got on the right track? Ummmmm..... it hasn't. Don't expect it here. May ad spending down, according to TNS media intelligence. When I get the company release, I'll post it, but for now, here's the AdAge article. The Progress & Freedom Foundation has released its 8th annual "Digital Economy Fact Book." It's an overview of the breadth and depth of the digital economy, worldwide. It has chapters on e-commerce, the communications industry, the hardware sector, digital media, the global use of the Internet and threats (like spyware, spam, etc.) to the digital economy. The report is downloadable as a PDF for free. Really Neat Stuff, Even Textbooks with Ads! Cynical take: the pharma biz' spending on TV ads has gotten them lots of negative press and raised the hackles of consumer advocates. Do you think that web promotions are a bit under the radar and may potentially be more effective? I do. Ads are coming to "texbooks" says the NYT--- perhaps they'll fix the spelling error by the time you read this. I never thought I'd see ad-sponsored textbooks, but in an e-format, anything is possible. LA Times article about a new book called "Convergence Culture" which sounds like they hate it, and then they say it's good. I hate when they do that. I wonder if the reviewer was an economist at one time. This convergence thing gets out of hand. This is a wealthy country, and people can buy all kinds of neat gadgets and have the time to use them. It's also a big country, with a diverse population. Even a 1% segment is 3 million people. People forget that even small niches can be very big here. The article also states "On one level, convergence refers to the breaking down of walls between methods of communication (telephone and telegraph) and mass communication media (newspapers, radio, television and the Internet). Jenkins sees a simultaneous reshaping of the relationships among individuals, media audiences, content and its producers — and therefore of popular culture itself. " Oh please! What time in the U.S. since the industrial revolution has there not been any of this? Availability of new products changes consumption patterns... shall I alert the media? Convergence? or is it MORE CHOICES being created by entrepreneurs and technologists to attract an audience. Convergence sounds so much more ominous and conspiratorial. New businesses are being built around those 80,000 net new businesses per month that the U.S. is creating... in this article, consultancies are focusing on this group. Jack Trout writes about the stupidity of mission statements. Next time you're asked to write one, pull this out. Those awful spam e-mails have some of the funniest "from" names. This blog site has created obituaries for the imaginary people who are so concerned about our mortgage payments, our desire to buy worthless penny stocks and make a fortune, and our heartfelt need for larger extremities that will increase our marital joys. Still, there is no press release about any of the pro-print stories over the year... just stories about who's joined the association. The Interactive Advertising Bureau is a better model for our industry, but they have their own problems. I'd rather have theirs. The article is by Burton Malkiel, who wrote the famous and excellent "Random Walk Down Wall Street," which is one of the best business and investment books... and best statistical analysis books... I've ever read. A new 9th edition will be published in January. Gosh, others must think it's pretty good, too! Malkiel is not that worried about the inversion this time. I still am. He's a famous Princeton economist. I'm a part time economist with no discernable means of income. We're both bald guys. He has a famous book. Good book-- its review is the subject of my upcoming WTT column this Friday. Econospinning by Barrons economist Gene Epstein. The first 11 chapters would be best suited for stat-geeks, but 12-17 and the afterword are for everyone. I highly recommend it. No popular news outlet or pundit is spared his sharp pen. You will have a far better understanding of what data "say" and "do not say," how to cut through media shallow reporting, and how to properly use data. Cenveo is attempting to buy Banta. Nothing could be a more horrible idea for the Banta folks. Cenveo was a badly run company, and they needed the takeover shake-up to unravel their lack of economies after some dubious acquisitions that were "aggressively" financed. Banta, on the other hand, is a well run company in a significantly retrograde market, and is doing quite well restructuring on its own, and seeking new markets, especially internationally. Banta should be left alone. But why this approach? Perhaps the Cenveo management is already looking for a way out of their current situation? Banta should be the one on an acquisition search. But from their historical lack of activity in this area, I have always felt that they have realized investing in their own company organically is a far better long-term use of resources, avoiding finance and transition risks. Watch for Banta to attempt to go private, or to merge with someone who is already private and also successful as a means to avoid the cost and business disruption of an attempted takeover... there's another successful printing company in Wisconsin, you know. In the meantime, Banta stock may run-up as this heats up in the press... maybe that's the idea? Banta stock jumped about a third, and as I write this, its P/E is 15ish and its forward P/E is 13ish. Assuming a P/E of 20, it could hit $60 and still not be considered overvalued by many. A personalization story: get your own Wheaties box! This Advertising Age headline caught my attention immediately: "New Book Reports 37% of All Advertising Is WastedFive-Year Research Project Tracked $1 Billion in Spending by 36 Major Marketers." After all these years of that damn joke "half of all advertising dollars are wasted, but no one knows which half," we finally have someone who has taken a serious look at the subject. but inside me there was a little voice that went "37% wasted, 37% not wasted, 26% undecided"
Small businesses spending more online... the interview in this article specifically discusses direct mail vs. online. Seems like the online folks have statistics... and the printing industry doesn't. In the new vs old media trench war, can we defend ourselves? Home Depot charging suppliers to put video up on their web site. What does this mean? It means that Home Depot is now... a publisher! I got a release about the Interactive Advertising Bureau adding 27 new members. http://www.iab.net/news/pr_2006_07_31.asp I then went on their website, again, to check if there are any printing companies (or God forbid, suppliers) that are members. Still a big ZERO. "Hold your friends close, your enemies closer," is the old saying. Am I the only one who knows that? "...graphic communications sales jumped 14 percent to $908 million and operating earnings reached $22 million, compared with a loss of $42 million a year ago." AOL bills dead people; and they think giving the service away for free will solve their business problems? It's been customer service all along. Oh, and the content stunk too. My life got better the day I quit AOL. Which reminded me of the 1981 movie "Looker"
I love stories about taxes and tax avoidance, because higher tax rates just create schemes to avoid them. Why is there such a hubub over the elimination of the estate tax? What would insurance companies and tax attorneys and estate lawyers do? There's a whole industry built on the creation of trusts and selling of insurance products (like second-to-die insurance, whose sole purpose is to pay estate taxes of heirs, for the most part). A couple of postings ago, I linked to an article about people leaving France because of taxes. Here's a good one: the Rolling Stones are only paying about 1.6% tax on their multi-decade earnings of more than 242 million pounds! England has flattened its tax rates over the years, but it's really not flat enough. As long as compliance costs are outweighed by potential taxes, there will be a market for tax avoidance services. When compliance has virtually no cost, and tax rates are low, collections usually skyrocket. Compliance "advice" is only affordable by wealthy tax-avoiders. When I think of how many middle-class families earn their way into the Alternative Minimum Tax and then get slammed with it, it's no wonder they lose their desire to work harder. Corporate tax attorneys learn how to play this game very well. The idea that there is an industry and a profession built on avoiding taxes, rather than creating wealth through investment in human activity, is really a sad commentary that things have really gotten out of hand, and have been that way for a long time. Low tax rates, taxed at the source of activity, and no taxes on savings, would go a long way to promoting thrift, self-reliance, and entrepreneurship. June '06 Printing Shipments... UP! May '06 Revised... UP! US commercial printing shipments for June, in current dollar terms, were up compared to June 2005 (+$155 million), and May's shipments were revised up as well (that +$67 million increase is now a +$215 increase). For the first six months of the year, shipments were down -1.2%. May was up 2.9% compared to last year; June was up 2.0%; for the year it's -$557mm, or -$92mm a month. Last year's steep decline began in June, with a horrible -$450 million decline compared to 2004. This does not make up that lost ground. The interaction of digital media and print is highlighted in a Deloitte report done for the UK's Online Publishers Association. Perhaps that association the shall not be named should be sent a copy. Speaking of the UK, their Direct Marketing Association has started a Mobile Marketing Council. http://www.e-consultancy.com/news-blog/361440/new-mobile-marketing-council.html Thet led me to wonder if the US DMA had done something similar. No, because there is already a Mobile Marketing Association with whom they do some cooperative things. The web site is quite good. http://www.mmaglobal.com/ Their rendering of the mobile marketing ecosystem is cool http://mmaglobal.com/themes/mma/images/eco_large.jpg --- whether or not it's the way the industry works is beside the point, but the image is pretty neat and makes you think. The association that shan't be named would probably do well to post a link to this article on their site. It's about GM's Saturn promotion using direct mail and e-mail. Forty-one percent of North American households now have broadband Internet access at home -- up from 29 percent at the end of 2004. Seventy-five percent of North American households have mobile phones, and almost half of them make the bulk of their long-distance phone calls on these mobile phones. Forty-five percent of Gen Yers, 27 percent of Gen Xers, and 17 percent of 41- to 50-year-old Younger Boomers who have a mobile phone use it for data services, led by text messaging, ring tones, and games. Cross-channel shopping continues to grow. Gen Yers, for example, are 73 percent more likely to research online and shop offline today than they were in 2004. Ninety-one percent of online households use a search engine once a week or more. For online Gen Yers and Gen Xers, Google attracts 62 percent of searchers, and 25 percent limit their searches to only Google. Seventy-eight percent of online Gen Yers and 61 percent of online Seniors aged 62 and up book or research travel online. Don't believe blogs are important? Then don't read this article from Advertising Age about where some of the industry's heavy hitters stay on top of the news. Oh yeah, those blogs? Along with podcasts, they're in the top 5 ways of promoting in the B2B market.